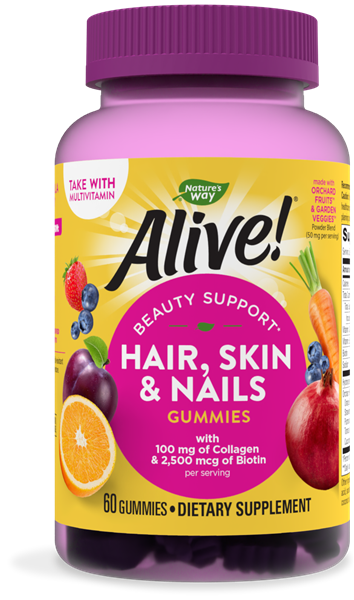 Alive!® Hair, Skin & Nails Gummies - Nature's Way®. Alive!® Hair, Skin & Nails Gummies support your self-care with an advanced beauty formula for lustrous hair, strong nails, and healthy skin, all in a delicious gummy. Each daily dose delivers high-potency vitamins to boost your beauty regimen. Chew 2 gummies daily. If pregnant, nursing, or taking any medications, consult a healthcare professional before use.